Is Criminalizing Mental Health Wise Policy? Part II of a four-part series looking at the sorry state of treating the mentally ill — beyond warehousing people in institutions or prisons — and the tentative efforts to improve the situation. Part I looked at the scope of the problem and the downbeat assessments by experts. In her worst nightmares, Linda Stewart-Oaten never dreamed her son Chris would murder her cousin Sylvia. Chris, who suffers from schizoaffective disorder, a combination of schizophrenia and bipolar disorder, has been in state prison ever since that day he shot his mother&apos;s cousin 14 years ago. "Of course, they (the jury) found him mentally fine," Stewart-Oaten said. In order to be judged criminally insane, it must be found that the crime wasn&apos;t done with forethought. Because Chris went to find his mother&apos;s cousin with a gun, the jury deemed it premeditation. Stewart-Oaten had visited her son in Blue Lake, near Humboldt in Northern California, just a few weeks before her parents, who lived next door to Chris, called to say he was acting strangely. He was carving symbols into the lawn with the riding mower and placing items on the roof of the house. He would start laughing for no apparent reason and talk to people who weren&apos;t there. "I went into panic mode," Stewart-Oaten said. Chris had been discharged from the Navy only eight months before. After nearly nine years in the service, with an exemplary record, he started having trouble during his second deployment at sea. There was an episode — his mother believes it was his first psychotic break — involving a weapon that his buddies helped cover up. He was drinking heavily and clashing frequently with his commanding officer. When she arrived, she found Chris drunk, living in filth and surrounded by weapons; there were dozens of guns, including an AK-47, in the living room. Alarmed, she went to a nearby Veterans Affairs office looking for help. The VA called the police chief, and they made a plan to get Chris to come into the mental health clinic for evaluation. "They didn&apos;t even hold him 72 hours," Stewart-Oaten said. And when he was released, he was so angry with his mom that he wouldn&apos;t talk to her. She tried to get the VA and the police chief to do something — anything. "Everyone told me, &apos;You&apos;re an overly involved mom, and our hands are tied unless he does something.&apos;"
She drove home to Southern California fearing the worst. "I knew that something awful was going to happen, and I just felt powerless to stop it." A month later, her dad called and said, simply, "Are you sitting down? Sylvia&apos;s dead. He killed her." Stewart-Oaten&apos;s cousin was chairman of the Native American tribe in Blue Lake. She had, only a few days before, denied Chris&apos; request to join the tribe, even though he had the requisite Native American credentials. Chris has been serving a 29-years-to-life sentence in one of the state&apos;s maximum-security prisons ever since. It has been 14 years of delusions, indifferent guards, doctors who seem to delight in experimenting with his medications — including taking him off of them — and long stretches in administrative lockdown, what used to be called solitary. "He really needs to be in a psychiatric hospital, not a prison," Stewart-Oaten said. But prison is where many of the nation&apos;s severely mentally ill reside. Studies show at least 10 percent of the nation&apos;s prison and jail population — an estimated 218,000 individuals — suffer from some form of mental illness. In many ways, California&apos;s experience is representative of the rest of the country. When California passed the Lanterman-Petris-Short Act in 1967, intentions were good: to provide community-based housing and services for the mentally ill. Then-Gov. Ronald Reagan signed the legislation that emptied the state&apos;s mental institutions, but the community-based housing and services never materialized. Counties, unprepared to deal with thousands of mentally ill people, struggled to develop programs. After the property tax rollback known as Proposition 13 passed in 1978, funding dried up, and the mentally ill started to show up on the streets and in jails and prisons, where many remain today. It&apos;s a shift of resources from the mental health and social services budgets to the criminal justice system that has had serious consequences not only for the individuals but for society as a whole. The homeless mentally ill suffer physically and emotionally on the streets while communities struggle to address their problems. The incarcerated live under conditions that some experts say are worse than those of the old mental institutions. "The psychiatric care in a prison is the worst," Stewart-Oaten said. The guards use Chris&apos; medication as a tool to punish him, she explained. So if he acts out in some way, they take his meds from him. Within days he&apos;s psychotic, and they lock him in solitary. Or he&apos;ll finally get to the point where he is doing fairly well and is stable on his medications, and some new prison doctor will decide to take him off of them, Stewart-Oaten said. "These incidences never work in his favor. It&apos;s a Kafkaesque nightmare, and it never ends," she said. Though it&apos;s called the California Department of Corrections and Rehabilitation, "There is no rehabilitation that goes on there. It&apos;s inhumane," Stewart-Oaten says. "I have a very bitter taste in my mouth about the way California treats its prisoners." The state of California&apos;s prison system is in receivership by order of a federal court, which found in 2006 that medical care for inmates was worse than abysmal. The receiver, J. Clark Kelso, has since filed a detailed plan with the court that includes instituting an electronic inmate tracking system so medications can be monitored, recruiting more than 1,000 additional doctors and nurses and launching a number of "access to care" initiatives. 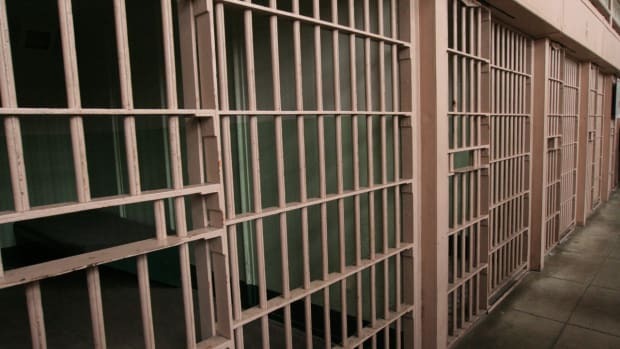 The plan also calls for construction of seven new facilities with 10,000 more inmate beds, half of which would be reserved for mentally ill inmates, according to Luis Patiño Jr., director of communications for the receiver&apos;s office. The Treatment Advocacy Center, a national organization that has worked for years to improve care of the mentally ill, said in an April 2007 briefing paper on criminalization of the mentally ill, "The nation&apos;s jail and prisons have become, de facto, the nation&apos;s largest psychiatric hospitals. There are now more severely mentally ill individuals in the Los Angeles County Jail, Chicago&apos;s Cook County Jail, or New York&apos;s Riker&apos;s Island Jail than there are in any single psychiatric hospital in the nation." The Arlington, Va.-based nonprofit center, founded by E. Fuller Torrey, works to raise awareness of and advocate for better treatment for those with severe mental illness. Torrey, the author of 11 books on schizophrenia and other severe mental illnesses, is also the executive director of the privately funded Stanley Research Medical Institute. His latest book, The Insanity Offense, details how the country has turned its back on the mentally ill over the past five decades and warns that society is endangered by it. Aside from the more serious offenses, the mentally ill also are more likely to end up in jail for minor offenses, often because of their delusions or paranoia. Because there are few effective community-based programs, jails and prisons are the places of last resort for the mentally ill, and the treatment they receive is inadequate if not harmful. "The reason they are there is because they didn&apos;t get the help they needed," said Ron Honberg, director of policy and legal affairs for the National Alliance on Mental Illness, a nationwide coalition of state and local families and advocates for the mentally ill.
Honberg said there has been some progress at the federal level in getting support for programs that show promise in reversing the trend. "There&apos;s more and more evidence that if you divert somebody who has been arrested but perhaps is not facing very, very serious charges into a program and provide the services they need, you significantly reduce the rate of recidivism and reduce the risk of hospitalization," Honberg said. The Mentally Ill Offender Treatment and Crime Reduction Act of 2004 is one program NAMI pushed strongly. "We continue to have bipartisan support for this program," Honberg explained of the $50 million effort. "It basically requires communities to develop collaborative plans as to how it&apos;s going to use these dollars. And it requires all the key elements to be involved — mental health professionals, judges, police, prosecutors. It also requires that they find matching state or community funds. These dollars are sort of serving as a catalyst. They&apos;re three-year grants that can be used for planning and implementation." The program uses the concept of "sequential intercept." "It&apos;s based on the premise that you basically need to be able to intervene and divert people at whatever level they come to the attention of the criminal justice system," Honberg said. So, for example, before booking, a specially trained Crisis Intervention Team would assess whether treatment at a mental health facility would be more appropriate. CITs are being utilized in many major cities around the country, including Portland, Ore.; Salt Lake City; Houston; and Memphis. After booking, a relatively new program called mental health court can provide treatment for those already incarcerated, and early results show those who go through the program spend less time in jail, get proper treatment and are less likely to end up in jail again. After release from jail, individuals are involved in a community-based treatment program that provides stability and, it&apos;s hoped, keeps them from repeating an offense that would put them back into the criminal justice system. "People with serious mental illness are about four times more likely to be victims of crime," said George Kaufmann, a member of the Mental Health Association in California board and an advocate with NAMI. "Most of the mentally ill who are in jail — they&apos;re there for stupid things." Kaufmann&apos;s son, who is recovering from schizophrenia, once urinated on the side of a patrol car and was arrested. Another time, he bit a sheriff&apos;s deputy on the arm, and the deputy pressed charges, Kaufmann said. Clearly those are incidents that, had the deputies recognized they were driven by mental illness, could have been dealt with differently, he said. But there is much that has to be done to reverse a decades-long trend of criminalizing the mentally ill.
Paul Erickson, the medical director of mental health services at Cottage Hospital in Santa Barbara, Calif., explained: "The big picture is we went from deinstitutionalization to ending up on the streets and in jail. They (the mentally ill) didn&apos;t have the right kinds of support at the community level. The states saw an opportunity to save money. Then the burden fell on the law enforcement system, which has a lot more public support than the mental health system." Next: Hope for a broken system: innovative programs that work.